I had the great pleasure of publishing a novel by Canadian author Matthew Hughes late last year: The Commons, under my Robert J. Sawyer Books imprint from Red Deer Press / Fitzhenry & Whiteside. "Matthew Hughes's Template is many things -- including a template others should follow to produce outstanding writing. Hughes has been the best-kept secret in SF for far too long: he's a towering talent, and Template is his best work to date. Bravo!" 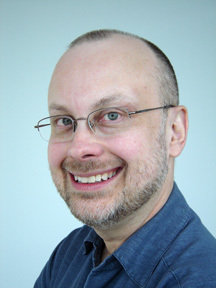 And now James Nicoll is trying to organize a blogosphere review-a-thon for Matt's new book. See James Nicoll's LiveJournal for all the details. 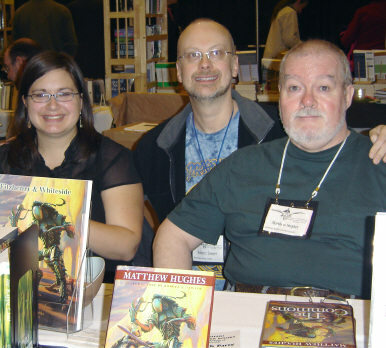 Photo above: Stephanie Stewart (US marketing director for Fitzhenry & Whiteside), editor Robert J. Sawyer, and author Matthew Hughes at the World Fantasy Convention, 2007.